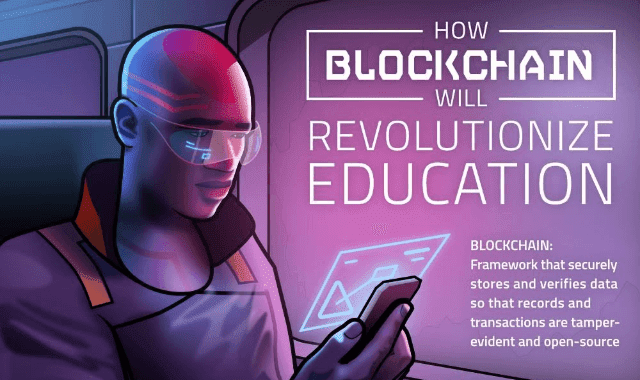 How Blockchain Will Revolutionize Education #Infographic ~ Visualistan '+g+"
Today’s college students are graduating with piles of student loan debt. Crippling costs mean more students are attending university part-time and many take longer than 6 years to graduate. After graduation, most struggle to find a job and end up working in positions that don’t require a degree. America’s higher education system needs a reset, and blockchain might be the key. The Institute for Blockchain Studies is creating massive open online courses (MOOCs) accredited with smart contracts. Smart contracts validate each students participation and look for proof-of-truth, show that students have learned the curriculum. Similar platforms could reduce the cost of higher education by reducing the time and costs of tracking attendance, grading, and monitoring accreditation requirements. MIT’s OpenCourseWare provide free course materials to anyone, while rewarding contributors with cryptocurrency. This platform ensures that teachers are fairly compensated, without passing the cost on to the learner.